Oh y'all. This recipe was beyond mouth-watering in my opinion!! I saw Giada De Laurentiis make this last week on a Food Network special and it looked simple and delicioius- and it was!! I have to tell y'all, though, that Mr. U didn't care for it. He thinks it's just because he's not a basil fan. Me? I ADORE fresh basil, so this was right up my alley!!! I served it with garlic parmesan mashed potatoes and sauteed zucchini. Yum. Meanwhile, blend the basil, garlic, lemon zest, remaining 1/4 cup lemon juice, 3/4 teaspoon salt, and 1/2 teaspoon pepper in a blender until smooth. Gradually blend in the remaining 1/3 cup oil. Season the basil sauce, to taste, with more salt and pepper, if desired. I am trying to go basil. I will have to try this recipe once the basil is ready for harvesting. Mmmmm, that looks and sounds delicious!!! I'm definitely going to have to try this! 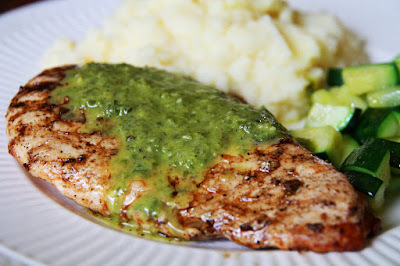 Okay, Jonathan would LOVE that chicken (minus the basil sauce)! That sounds yummy and easy peasy! I'm going to try this!